Legion Magazine enjoys hearing from you. We welcome Letters to the Editor, and submissions to the popular Humour Hunt column. You can also place notices in our Unit Reunions column. 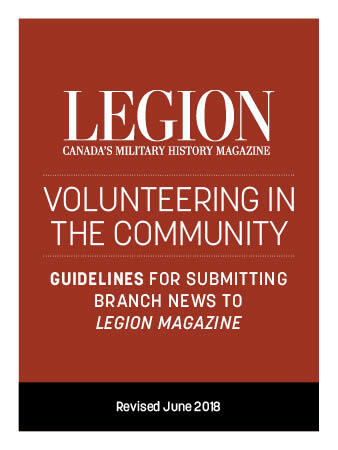 Material can be sent to us by e-mail at magazine@legion.ca. Or it may be sent to 86 Aird Place, Kanata, ON K2L 0A1 or faxed to (613) 591-0146. The Letters section is a forum for your comments on articles that have appeared in the magazine or on issues of general interest to Legion Magazine readers. The editor reserves the right to select and edit letters for length, clarity, accuracy and taste. When writing to us be sure to include first and last name, and the name of your community. Please include a day-time phone number in case we need to contact you. Letters selected for the magazine will also be candidates for the website. In other words, when you submit to the magazine you are also giving us permission to put the material on our website.